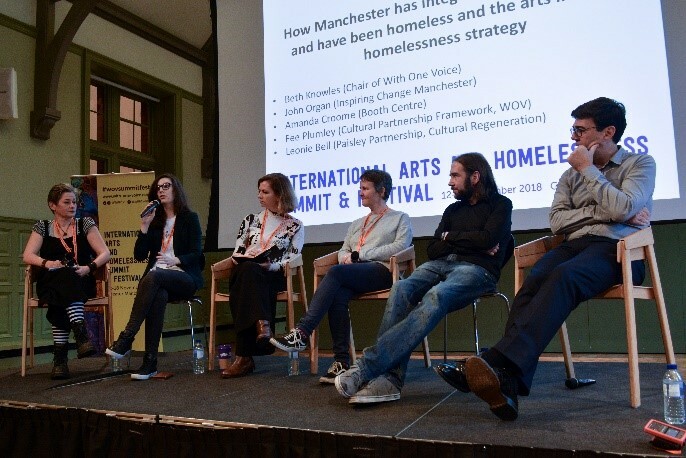 In November 2018, Theatre Royal’s Community Engagement Programme attended the With One Voice – International Arts and Homelessness Summit and Festival – Manchester 2018. 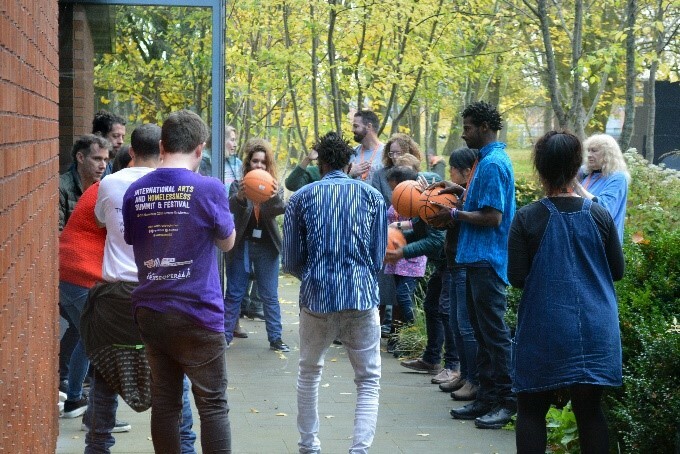 We were tasked to present the theatre’s work with homeless communities in rural Suffolk to an International audience of 250 delegates from 15 countries. We presented a short performance of two monologues developed through our work with The Bury Drop In – a culmination of three year’s work with Women’s Aid Bury St Edmunds and a photographic exhibition. We facilitated World Café style conversations, focussing on ‘Arts and Hidden Homelessness – from rural communities to people leaving care and people living in squats’, and drew on our experience of working with young homeless people in Bury through the YMCA and hostels. 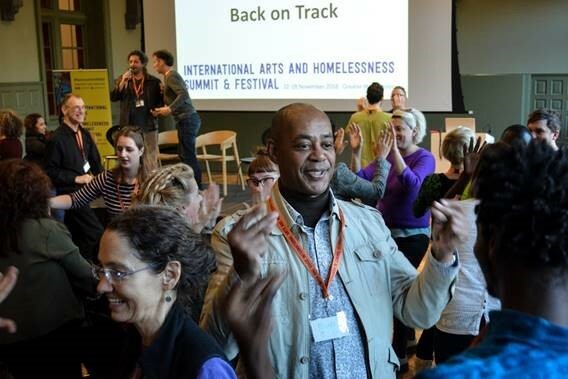 This inspirational summit and festival shared the work of arts organisations working with homeless communities across the globe – using visual art, theatre, poetry, dance, music and performance to improve the lives of homeless people. The delegates we met often seemed to have grown their projects through tenacity, passion, and a commitment to a fundamental belief that access and participation in arts and culture changes lives for the better; that art and culture is a human right and that being human involves making art. Many of these inspiring delegates had lived experience of homelessness and offered their experience to celebrate the role arts can play in tackling homelessness. So why arts and homelessness and why do the Theatre Royal deliver around this area in Bury St Edmunds? Homelessness is not just about housing; people who are homeless can suffer from a multitude of challenges from practical ‘house-lessness’ to low well-being, social isolation and stigma. The arts are being used effectively around the world to reduce social isolation by building social networks and increasing both physical and mental health and improving public attitudes – promoting understanding towards homeless people and enabling homeless people to express themselves so that their voice can be heard. At Theatre Royal we understand that we have an active role to play in easing some of the symptoms and conditions of ‘house-lessness’ and insecure housing. Using the tools of theatre and arts with our community has allowed us to uncover previously unexplored voices, exposure to new stories in our town and be a part of the solution; offering support through arts provision in Bury St Edmunds. In our town we have 157 beds for homeless people in hostels and additional beds in the women’s refuge. In 2017, it was estimated that Bury had 22 people sleeping rough. Our homeless charity partner organisation The Bury Drop In feeds over 60 homeless and vulnerably housed people every day it’s open. Shelter estimate that 1 in every 200 people in England are homeless and that 1 homeless person dies on the streets in the UK every day of the year. We are keen to be a part of the jigsaw of homelessness support by working with social sector partners, charities and policy makers to provide opportunities through the arts for self-expression, building well-being, social inclusion, positive public awareness and positive self-identity which we know brings so much to an individual’s journey through homelessness. We work with community partners and other services to support individuals and alleviate some of the trauma that low well-being and social isolation can bring through creative expression and theatre making, exposure to live theatre and volunteering opportunities. By doing this we are able to take an active role in supporting individuals with their desire to make positive choices as well as enrich the creative cannon here at Theatre Royal. Everyone has a story and it’s often said that every person has one good play in them. By working closely with our communities we have uncovered many surprising, moving and enthralling stories – distinctly home-grown but with universal themes and voices. Being a part of this International Arts and Homelessness Summit and Festival, we have been linked in with other organisations across the globe that we can learn from and inspired us to do more. 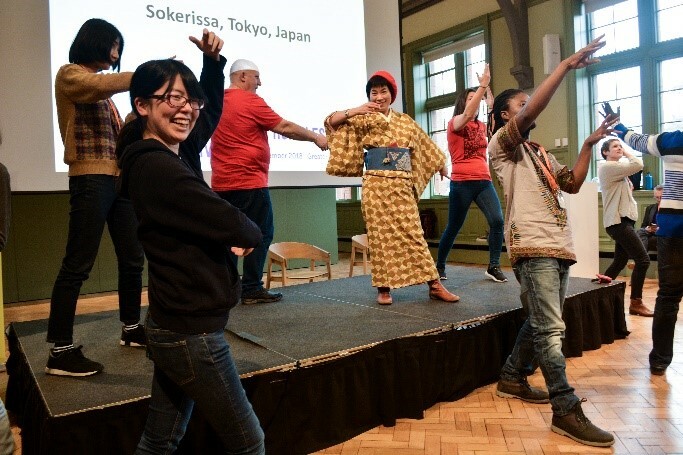 Countries including India, Brazil, USA, Canada, Jamaica and Japan sent projects including homeless choirs from Rio, performance art, poetry and dance from Japan, Rap from Uganda, films, photography and art work from Café Arts communities in London, Manchester, Mumbai, New York, Seattle, Toronto and many more. The summit and festival took over the whole of Manchester’s cultural spaces and homeless services including the Whitworth Gallery, Manchester Museum and Gallery, Castleford Gallery, The Royal Exchange, The Lowry, homeless shelters, the street and even Piccadilly Station. It felt like the whole of Manchester had galvanised around arts and homelessness with a determination to explore performance, practice, policy people and partnerships and set the city as a beacon and leader in practice and policy innovations in arts and homelessness. As part of our ongoing commitment to this work, we will be sharing the work of Theatre Royal Community Company on the Wed 19th and Thu 20th June 2019 where we will explore social issues, including homelessness in Bury St Edmunds over the past 200 years. This performance will be performed by members of the community who are currently meeting weekly to devise a new play. These creators have come through Theatre Royal’s Community Engagement programme over recent years and the play will be written and directed by Danusia Iwaszko as a part of the venues 200th Anniversary celebrations.